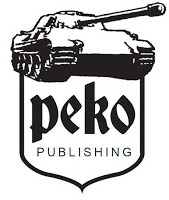 It’s hard to believe we have seen eight books from PeKo Publishing already. This Hungarian book maker has made quite a good catalogue already with their other books in the series. These books are all in the same format that readers seem to like. Large black and white photographs with a few sentences of text captions under each in both English and Hungarian. This – the newest book in the series that is the third book to feature the tough little tank destroyer the Sturmgeschütz III. This new book, called “Sturmgeschütz III on the battlefield Part 3” is a hardcover, landscape formatted book with only two pages of a brief introduction that tell you about how the tank operated in what sized units and how these changed during the war. This short into is followed by more than a hundred mainly unpublished photographs that are clear and easy to see on the nice and thick pages in the book. The StuG III’s in this book are (mostly all) captured whilst in action on the Eastern front, so there are lots of photographs from different weather conditions and areas of this great big battle in the East. Most of, if not all of these shots are not before published so there is lots of fresh inspiration and ideas for your future dioramas or knowledge from the large format pictures and text on every page. The shots go in an order almost chronological during the fighting on the eastern front from 1940 to 1944. We start with the short gunned Ausf.B tanks on the soviet roads in Operation Barbarossa. You will notice throughout this book that not only the model variant is noted but the manufacturing factory as well. So many of these early Ausf.B’s are shown with the canvas hoods covering their main top hull to protect against the dust or snow they are captured in. These books often have shots in a series like this one below. Two and three shots of the same sequence shed light on just what is going on in the scene as these vehicles go about their activities of repair, in convoy or in action. The text describes the action and the little differences of these vehicles from each other and how the theatre of war changes the appearance and fitting out of these tanks. The next version featured is the Ausf.F with a longer gun and bigger ammo. A lot of these are seen with more protection in the form of more tracks strapped to the sides and front to combat the soviet guns. Several of these long barrelled F and the later Ausf.G’s versions are seen in a series of shots in the snow. On dusty roads and even nose down in a river. As the battle rages on you can see the change in these Ausf.G tanks. The extra armour, the appearance of non-typical camo and the appearance of leaves and bushes as camouflage as the airpower battle waned on the front and the Soviet numbers increased to oppose the Germans. We see more wrecked vehicles on both sides but more StuG’s and their Russian and even funny enough some pictures with GI’s from the western front thrown in which break the character of the Eastern front theme. Not a minus, just unexpected bonus I suppose. Fighting in Central Europe sees the StuG III’s in Ukraine, Slovakia, Hungary and then Germany. Several variations are shown. The concrete front armoured versions and some with the square Zimmerit as well as large side-skirted tanks. In the last pages we see a large variation of non-standard StuGs with many wearing different camo schemes in ambush style, large blocks of colours and some in winter whitewash – this one being painted on the go! This is all in this tittle. The inclusion of a few early and late western front pictures breaks with the “eastern Front” theme of the book but they are worthy additions to the tittle. The variation and the genesis of the StuG III are easy to see in this book and the pictures and helpful text are interesting and inspiring to make your own version. I found a fair few ideas and a lot of inspiration with some new knowledge in this book. It’s another worthy addition to the series and it’s hard to think that this is the third book to feature this tank. I can only look forward very much to a forth in this series. The other books in this series really shown on both their site but also on their Facebook site which has up to date announcement on their books – or you can just check back here if you wish!